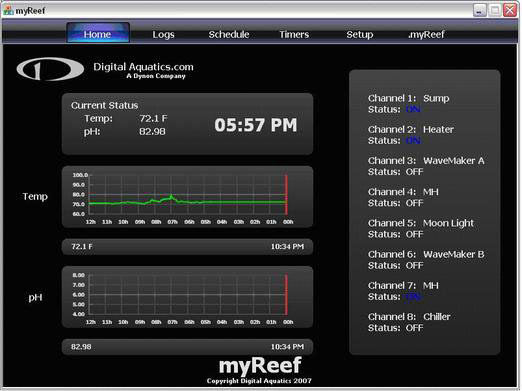 6/13/07 More details on the new ReefKeeper Software. In record time digital Aquatics has come out with this fantastic looking Release. "Here's a brief statement from DA"
myReef is a dynamic application that will offer a wide variety of tools and resources for the casual reefer all the way too the experienced pro. You can use myReef with or without an RK2. However you will get a much larger set of feature's when used in conjunction with a Digital Aquatics RK2. Digital Aquatics states that they will have a download up shortly, and everyone is invited to take it for a spin, DA invites people to go out and "Kick! the tires and see if myReef is right for you". Visit their website for the latest info on the new application. Here is a list of SOME of the features that myReef will offer on its initial release. You will be able to download the full version of myReef for free. a. Get email alerts when its time the change the MH Bulbs etc. myReef's A powerful tool in a good looking package, and the best part, it doesnt cost you a cent! It's a FREE Download. Keep checking the DA website, as more Information on other features will be released by DA soon. Digital Aquatics is asking people NOT to contact them via Email or Phone for more information, as they are busily trying to get this release ready for next weeks distribution. Many Thanks to Scott at DA for the update and the photos. Here are Some New Screen shots for you RK2 owners and future owners to enjoy.